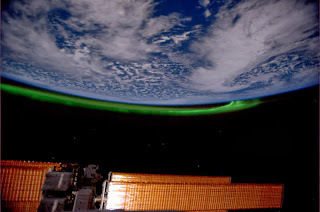 It regularly fills the skies over the poles with bright light shows known as the aurora. It destroys satellites, possibly resulting in the failure of wireless communications, ATMs and television. It could leave large areas without power for months. But what is ‘it’? - Space Weather. 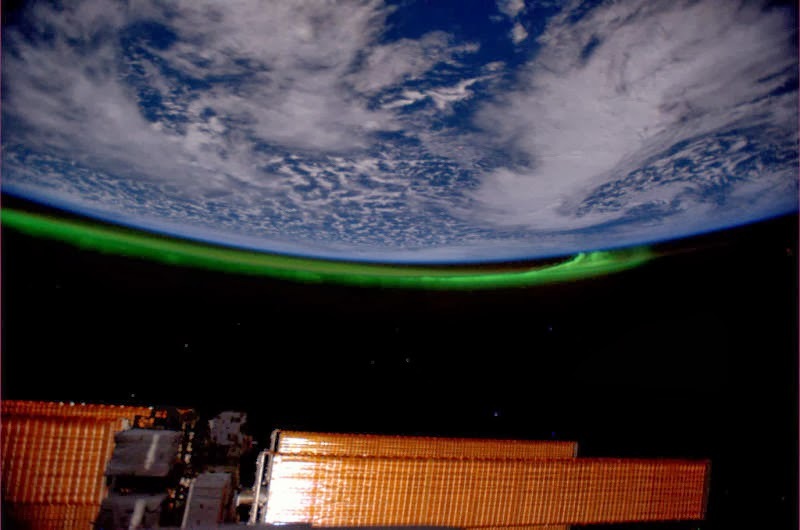 Space weather is dangerous and a large event could have a massive impact on society. But what is ‘Space Weather’? What are the possible effects? What are the questions that still need answering? ‘Space Weather’ describes the happenings in the environment surrounding the Earth. This ‘weather’ is fuelled by the Sun’s unpredictable activities – more specifically solar flares, Coronal Mass Ejections (CMEs), coronal holes and solar prominences. We are completely dependent on the Sun, it can be our best friend or our worst enemy. [EDIT - June 2014] This article is now also available as a video, thanks to a group of media students at Sheffield Hallam University who created an animated version of our article. For more information, read about how we partner with universities to create videos. “Pluto is dead”, according to Mike Brown (in How I Killed Pluto and Why it Had it Coming), but that doesn’t mean we shouldn’t go there. In fact, this is one of the reasons why we are going there. Unsurprisingly, given the distances involved, we know very little about Pluto (“You may think it’s a long way to the shops, but that’s just peanuts to space,” to quote Douglas Adams in The Hitchhiker’s Guide to the Galaxy). Discovered in 1930, Pluto remains something of a mystery, as astronomers are a long way from understanding its origin. Pluto is one of many rocky and icy bodies which form the Kuiper Belt, in the outer region of the solar system. Pluto was discovered by Clyde Tombaugh in a systematic search for a planet beyond Neptune. Its high surface reflectivity initially made it appear larger than it actually is. Pluto was initially considered as a planet, before the International Astronomical Union officially defined what a planet was. At one point Pluto was thought to be a rogue moon of Neptune. On August 12 2013, NASA's Juno Spacecraft reached the halfway point on it's journey to Jupiter. Since launching back in 2011, it has travelled over ten times the distance from the Earth to the Sun, and has performed a series of planetary flybys and deep space manoeuvres. Tomorrow on October 9, Juno will come within 350 miles of Earth's surface. This is known as a gravity assist, or a gravitational slingshot. 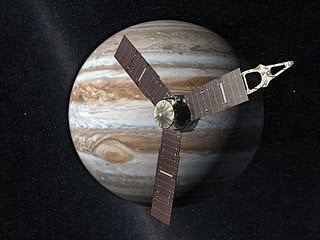 After Juno says its farewells to planet Earth for the final time, it will race towards the Jovian system before its slated arrival time of 22:29 EST on July 4, 2016, give or take a few minutes! But what has Juno done since launch? 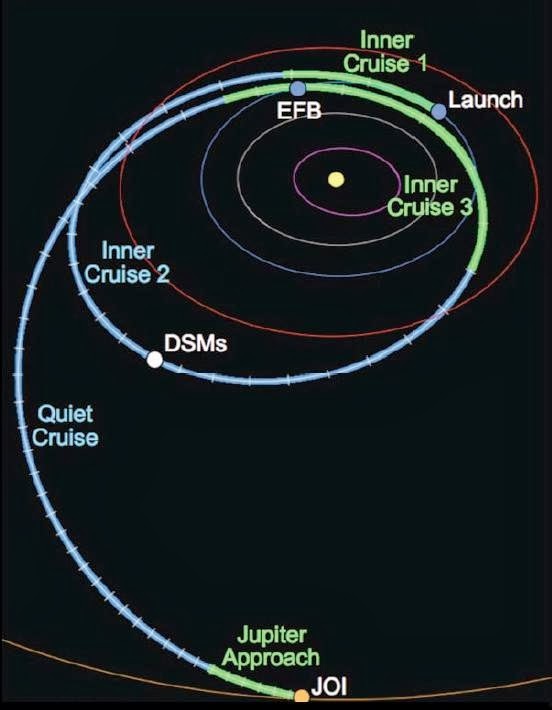 Well, the Jovian explorer has been sent out past the orbit of Mars, and performed crucial Deep Space Maneuvers to set itself up for tomorrow's flyby of Earth. 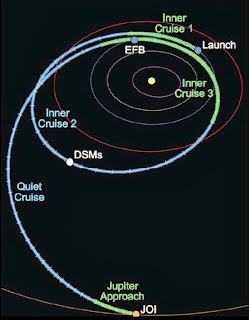 "On Oct. 9, Juno will come within 347 miles (559 kilometers) of Earth. The Earth flyby will give Juno a kick in the pants, boosting its velocity by 16,330 mph (about 7.3 kilometers per second). From there, it's next stop Jupiter... Almost like a second launch for free!" Confused? Well, think of it this way: if a golfer putts a ball towards the edge of the hole, and the ball does not fall into the cup, instead hitting the very edge of the hole and "lipping out", the ball will shoot off in another direction at a faster speed than before. You got the hang of this? Right, let's move on. However, it is also worth noting that as well as this extremely predictable increase in speed, the spacecraft also experiences a tiny tiny change in velocity due to something else. But just why do spacecraft that flyby Earth receive this tiny change in acceleration? Well, to put it simply, no one is really quite sure! This is known as the Flyby Anomaly, and it's something that science doesn't really have an answer for at the moment. What Causes the Flyby Anomaly? Scientists have theorised (and later dismissed) this unexpected source of energy as being caused by atmosphere, tides, magnetism or radiation. The possible remaining solutions for this problem include that there might be a halo of dark matter around the Earth, as well the theory that it is caused by the rotation of the Earth itself. In the search for extraterrestrial life, water is highly regarded as a key ingredient for life to arise. Its polar structure allows it to form "hydrogen bonds," which are crucial for the formation of large organic carbon structures like DNA. Water is so important that scientists are constantly looking for planets in the "habitable zone" around their stars, a land flowing with milk and honey—er, I mean, liquid water. A habitable zone is determined by the properties of the star—with very bright, hot stars, it would be further out; and with dim, cool stars, liquid water could exist much closer in. However, liquid water can exist in some out-of-the-way places. Several of Jupiter's moons experience such strong gravitational interactions with Jupiter and each other that they are heated up by tidal flexing, making them warm enough to sustain water in its liquid form, despite being five times further away from Sun than the Earth is! One strong candidate for a watery moon is Europa. It has a frozen ice outer shell, and it's speculated that underneath might be that liquid gold - water. Scientists are still unsure just how much internal heating Europa receives, so it's still not fully known how thick the ice is. Tidal flexing keeps it dynamic and changing, and scientists have observed that the surface is lined with cracks, possibly formed from the ice chaotically pulling apart and smushing back together like giant icebergs in a mosh-pit. This is some of the evidence suggesting there might be a liquid Europan ocean underneath its icy crust. Mercury may be first on most lists of planets, but it’s easily the least explored of all the inner planets. The heat and immense gravitational pull of the nearby Sun has made visiting Mercury difficult, but fly-bys from NASA’s Mariner 10 in the late 1970s gave us the first close-up glimpses. 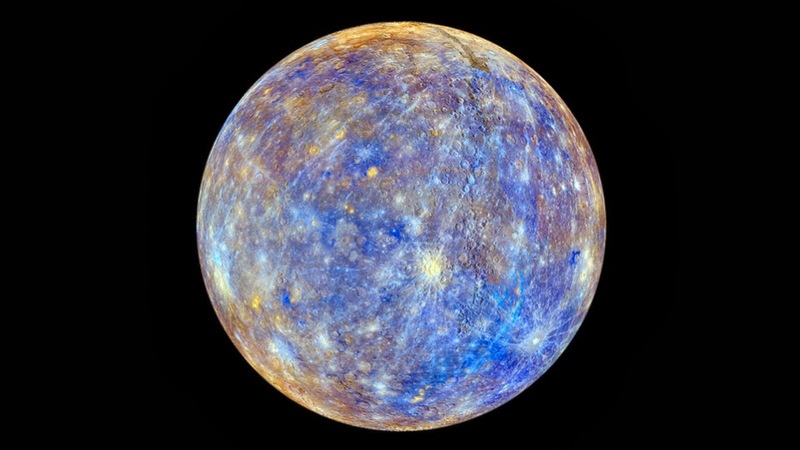 Mercury then remained unvisited until 2004 when NASA launched the MErcury Surface, Space ENvironment, GEochemistry, and Ranging (MESSENGER) probe. MESSENGER has been orbiting Mercury since 2011, taking photos and running analyses to tackle some of our deepest questions about the smallest and closest planet to the Sun. One mystery for MESSENGER is why Mercury is so dense. The four inner planets (Mercury, Venus, Earth and Mars) are all comprised of a dense metallic core surrounded by a rocky mantle and crust – but Mercury is unusual in having far more metal than rock. Mercury’s metal core is estimated to make up 75% of the planet’s radius, but Earth’s is just 10%. 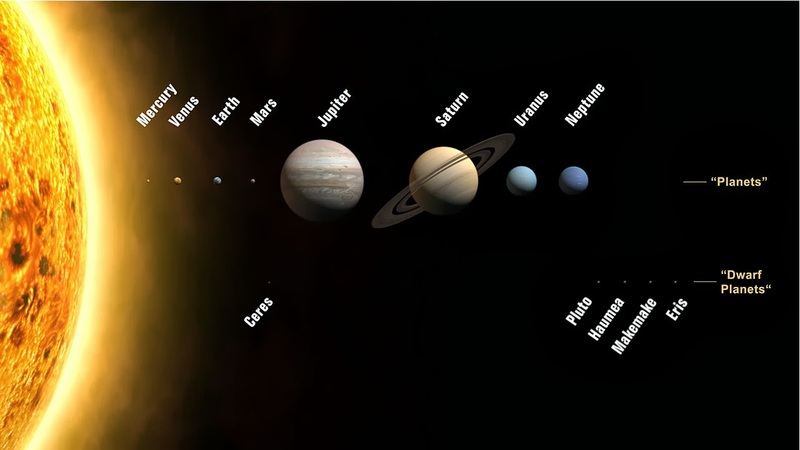 Why are the planets so different? If you were to take the eight planets in our solar system and look at them as a whole, there would be two obvious groupings. 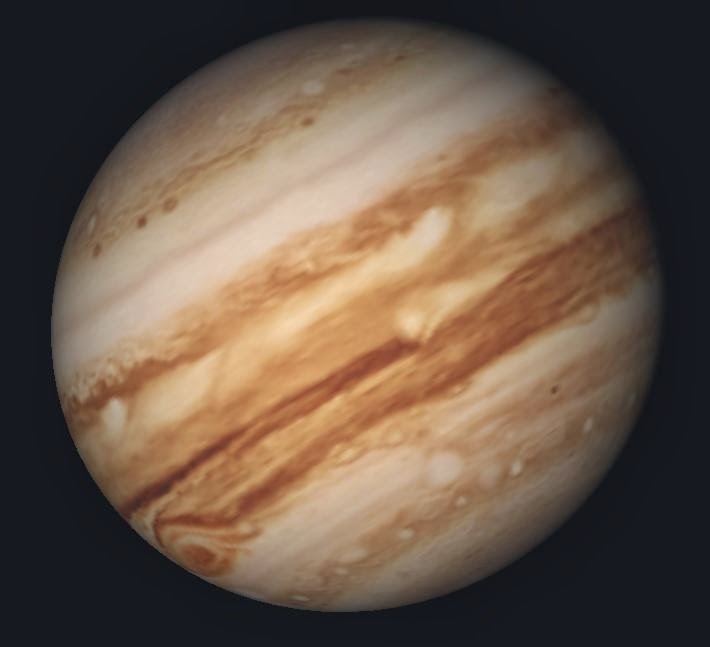 The first of these are the giant planets, which are well deserving of their names - hundreds of times larger than the others and with thousands of times more mass. The spectacular contrast between the four giants (Jupiter, Saturn, Uranus and Neptune) and the other planets is fairly easy to explain. 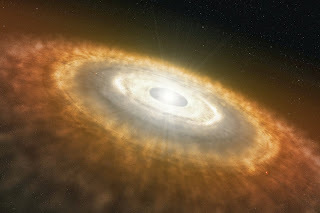 Before the planets were formed, all the material which they now contain was spread out in a giant ‘protoplanetary disc’. Artist's impression of a protoplanetary disc. The four ‘gas giants’ formed outside the ‘snow line’ of our early solar system, where it was cold enough to allow the relatively abundant volatile substances like water or ammonia to condense out. This gave the first baby planets in this region of the disc plenty of liquid and solid material to sweep up to form bigger and bigger planets in a process called accretion. This process is a runaway one: gaining more mass means more gravity means gaining more mass. And hence we get the giant planets, huge balls of gaseous material that (we think) contain some kind of rocky or metallic core at their centre. Some questions remain about their formation, particularly about their potential travels throughout the disc early in their lives, but that’s not what we’re here to look at right now. As the catalogue of planets orbiting other stars (called exoplanets) known to us continues to grow, increasing discoveries of potentially ‘habitable’ planets are likely to follow. The ‘habitable zone’ (HZ) concept, which was introduced in a previous post, is becoming increasingly important to our interpretation of these announcements. However, when used unilaterally as it often is, the HZ metric may be misleading - and should rather be considered as a good initial indicator of possible habitable conditions, interpreted relative to other available planetary characteristics. To the best of our knowledge, Hungry Space Bears aren't really the leading cause of failure on interplanetary missions. Image copyright ©Luke Surl, used with permission. 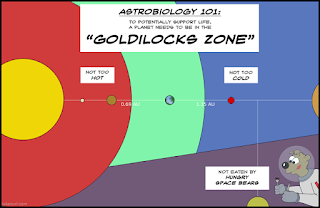 The habitable zone describes the theoretical distance (with both upper and lower limits) at which a given planet must orbit a star to support the basic fundamental requirements for the existence of life based on our understanding of the evolution of the biosphere on Earth. It is often referred to as "the Goldilocks Zone", since it looks for the region "not too hot, and not too cold". The concept is based on terrestrial (rocky, as opposed to gaseous or icy) planets that exhibit dynamic tectonic activity (volcanism and/or possible plate tectonics) and that have active magnetic fields to protect their atmospheres from high energy stellar particles that could strip it away. The composition of atmosphere is assumed to consist of water vapour, carbon dioxide and nitrogen with liquid water available at the surface, as on the Earth. Liquid water is the key; the giver of life and the fundamental factor in defining the habitable zone in any planetary system. Back in August we announced that we intended to break our usual cycle of one post every 1-2 weeks, and post an article every day during World Space Week (Oct 4-10). 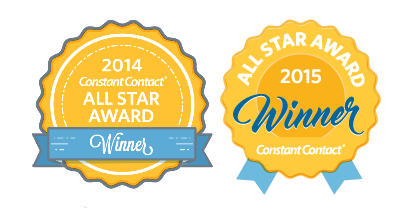 To make this possible, we invited people to send us their articles, with the promise we'd publish the best. Tomorrow, we welcome back Andrew Rushby (University of East Anglia), who has been posting a series of articles about planets orbiting other stars throughout the year. We kick off our World Space Week with the final post of his series which asks: "Are Exoplanets Habitable?" On Saturday, Adam Stevens (Open University) brings us back to our own solar system, and asks "Why are the planets so different?" On Sunday, we start a journey through the solar system to look in more detail at these varied planets we call neighbours. Emily Coyte (University of Bristol) takes us close to the Sun, with "Messages from Mercury". On Monday, Lorinda Dajose (California Institute of Technology) takes us "Breaking out of the Habitable Zone" and looking for signs of life out at Jupiter's icy moon Europa. On Tuesday, just in time for the Juno spacecraft's flyby of the Earth on Wednesday, 16-year old Irish space blogger Cian O'Regan explains why Juno is being sent to investigate the giant planet Jupiter, and why arriving back at the Earth still counts as "half way there". On Wednesday, freelance writer Peter Ray Allison takes us all the out to frigid edges of our solar system, and delves into "Pluto's New Horizons". On Thursday, we finish off by welcoming back Cait Percy (University of Southampton) who explains the treacherous and mysterious nature of space weather.